This late night raga is from the ‘Khamaj’ Thata. It has five notes while ascending (Aaroha) and six notes while descending (Avroha). The Vaadi Swara (the note most frequently used or emphasised) is ‘Ga’ (the third note) and the Samvaadi (the second most frequently used note) is ‘Ni’ (the seventh note). The second note ‘Re’ is forbidden while ascending. This is also a late night raga. This is from the ‘Asawari’ Thata. The Vaadi Swara (the note most frequently used or emphasised) is ‘Sa’ and Samvaadi (the second most frequently used note) is ‘Pa’. Both varieties of the ‘N’ swara are used. The third note ‘Ga’ is forbidden while ascending. 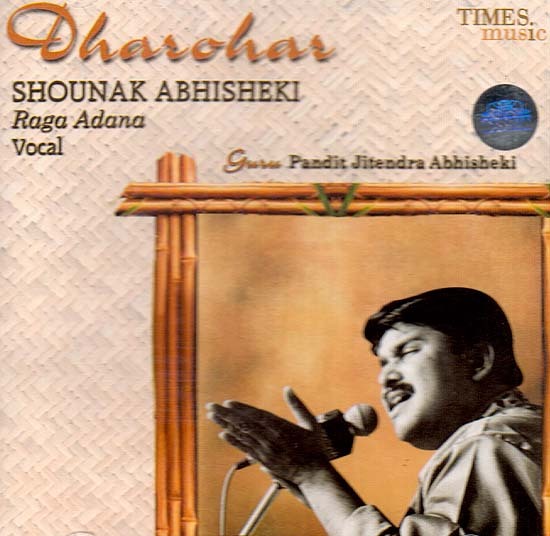 Shri Shounak is the son and disciple of the famous vocalist Pandit Jitendra Abhisheki, a doyen of the Agra Gharana. He has had the privilege of learning under the able guidance of his father and Guru since childhood, which has no doubt led to his emergence as one of the foremost young vocalists on the classical scene today. Shounak’s former training was done under Smt. Kamaltai Tambe of the Jaipur Gharana. Besides ‘Khayal’ gayaki, he has had training in all other aspects of vocal music like Thumri, Tappa, Natyasangeet, Hindi & Marathi Bhajans, etc. Shounak is by education a law graduate. He accompanied his father for vocal support for the last decade of his father’s life in all major music festivals in India and Abroad. 46 min. & 42 sec.